All of us have dreams that we wish would come true. Some are 'practical' dreams; technically speaking these dreams could come true under the right circumstances. Other dreams are delightfully fantastical and we know that the only place that these dreams can live in is in our imaginations. Today's picture book take us into the lives of three children who, thanks to a magical typewriter, are able to make their wishes come true. One day three children ride their bikes to the carousel, only to discover that is it closed. Most of the rides on the carousel are the traditional horses that you expect to see, but there is also a bumblebee ride, and on the seat of the bumblebee, right next to the pole that attaches it to the carousel, there is a box. The children lift the box down to the ground, open it, and find out that it contains a typewriter. The little girl puts some paper in the typewriter and then she types the word Beach. In a moment the children are transported from their snowy home to a beach, complete with sun, sand, and a blue sky. While his friends are playing in the surf, one of the boys types the word Ball on the paper, and just like that a large beach ball appears. The third child types the word Ice Cream and a huge plastic pail, full of ice cream, turns up. Then it is the girl’s turn again. She types the word Crab on the paper and sure enough a crab materializes on the sand. The problem is that this crab, like the ball and the pail of ice cream, is huge! This gorgeous wordless picture book serves as a tribute to the imagination, and it will take readers into that wonderful world of what if. What would they type on a typewriter that could make dreams come true? What would they do if they were confronted by a huge crab? Children will see, through the magic typewriter, that words have enormous power, and perhaps they will wonder if words in the real world are just as remarkable, though in a different way. Poetry Friday with a review of What are you Glad about? What are you Mad About? Feelings can be so confusing sometimes. We can feel two contradictory emotions at the same time, or we experience an emotion that we can't identify and don't understand. Today's poetry book explores the feelings people have in a creative and clever way. Touches of humor in some of the poems reminds us that there is always room for a smile or a laugh. When life is hard, or when we are living in a place and/or a time that is full of challenges, it is so easy to despair and give up hope. At such times we forget to notice the little gifts that life is giving us, the little things that brighten our world and make it a happier place. A friend's hug, the smile of a child, a a gorgeous sunrise. These things all give us hope when we experience them. Today's Book of Hope takes us to a grim place where hope is scarce. Until something miraculous happens. One day, after a rain shower, a little boy who lives in a war ravaged world sees a little plant pushing its way through the soil. The little boy carefully tends the plant, and in time he recognizes that it is a grapevine. The vine grows up the barbed wire fence that prevents the little boy from going to the hills that he once visited with his father. The vine grows and prospers, and soon it provides the children in the war zone with a shady place to play. Then something terrible happens, soldiers from the other side of the fence pull up the vine and they throw it in a ditch. The little boy can't help feeling that his heart is going to break; but is doesn't break after all. In this powerful and very moving picture book, Michael Foreman celebrates the resilience and courage of the human spirit. He shows his readers how people, even in the most trying of times, can find something to live for. Against the stark grey landscape of ruined homes and lives, Michael Foreman gives us the warm glow of something green and living, and we can see how a simple plant can give people hope for a better future. This title is out of print in the United States, but new and used copies are easy to find online. The book is still in print in the U.K.
Finding friends isn't always easy, and the search for people to connect with can be a lonely one. In today's picture book you are going to meet an incredibly sweet little hedgehog who learns that she needs to find friendship, and who goes on an incredible journey to find it. Growing up can be tough, and for some the teenage years are a time full of confusion and trouble. This was certainly true for me and I therefore tend to stay away from books about teens who are in crisis. I don't particularly want to relive that time of my life, thank you very much! However, today's novel in verse caught my attention, and though it is a painful story at times, I am so glad that I read it. It is so beautifully written and so wonderfully honest. When she leaves the theater that night, walking in the rain, Randall Faber gives Penny a bunch of flowers. He does not seem to mind that she made a complete mess of the play and suddenly she isn’t just Penny Morrow, the “Screw-up In the School Play.” Now she is “The Girl Randall Faber Likes,” who then becomes the girl who fainted when Randal Faber kissed her. To say that Penny feels humiliated is an understatement. The surprising thing is that Randall still wants to be her official boyfriend and so Penny finds herself holding hands with him, dancing with him, and trying to have conversations with him. She should be happy with her new status in life, but the truth of the matter is that she really does not like him that much. How did that happen? Many of us live in the past or the future. We look back on good times that are now gone, or look forward to what might be coming. We forget to appreciate the amazing and wonderful things that are happening to us right now, and those amazing and wonderful things can be simple everyday moments. Seeing that a favorite flower is blooming, or sharing a smile with a complete stranger are the kinds of in-the-now moments that we need to savor. Today's book of hope is all about celebrating the present, those times that enrich our lives in so many ways. Many of us spend our lives running from place to place, and from activity to activity. We rarely take the time to appreciate the now; to enjoy what we are doing right this minute. In this beautifully written and illustrated picture book, Liz Garton Scanlon and Marla Frazee have created a memorable text and lovely illustrations to tell the story of one day in the life of a family. As the day unfolds, we are reminded of the wonderful things that fill our lives, and the simple pleasures that make life so special. When the world without gets dark and stormy, when illness strikes, or when I am just worn down by life, I turn to a number of books for solace and comfort. One of the books I turn to is today's Book of Hope title. 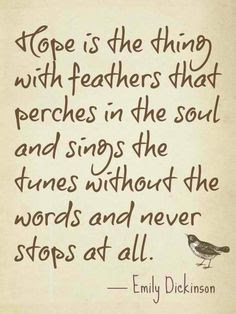 It may seem strange that I would consider Winnie the Pooh to be a book of hope, but I think it is just that. The Winnie the Pooh stories remind us of the simple joys, the little adventures, the funny situations, that make life rich and wonderful. Feeling rich in stories that are packed with humor and sweet affection most certainly gives the spirit a lift. 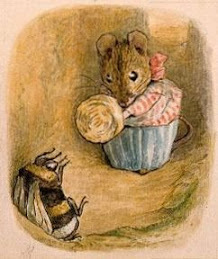 In the first story we are told, Pooh, who is very partial to food in general, and honey in particular, decides that he wants to climb a tree because there is a large bee hive at the top. Of course where there are bees there is honey, and where there is honey there are Poohs. At first Pooh tries climbing up the tree in the old fashioned way, but that turns out to be a painful exercise. So he heads off to find Christopher Robin, whom he hopes might have a solution to his problem. Sure enough, before long, Pooh is floating up next to the honey bee tree hanging from a large blue balloon. There still is a problem however, and the problem is that the bees, which are not unintelligent creatures, are beginning to get "suspicious." Poor Pooh. This is only the first of several rather uncomfortable adventures that he has. In the next tale we are told, the bear, who as I have said enjoys food, gets stuck in Rabbit's doorway. Pooh blames the size of the doorway, and Rabbit blames the size of Pooh. There is nothing to be done however, for Pooh is stuck tight. All Pooh can do is listen to a "Sustaining Book such as would help and comfort a Wedged Bear in Great Tightness" and wait to get thinner. A. A. Milne's deliciously funny stories about this lovable bear, with their wonderful use of language, will never lose their charm. Pooh and his friends speak a language all children understand, and they make the kinds of mistakes that they understand too. At the same time, there can be no doubt that Pooh's tales delight adults as well. There is something about the bear's simple needs, his obvious devotion to his friends, and his delightful way of expressing himself that makes Pooh a panacea for a tired mind, an aching heart, or a weary spirit. Concrete poems, or poems that are laid out on a page to create pictures, are such fun to explore; and to write. Poets who like to write such poems are wonderfully creative and they often inject their writings with a sense of fun as well. Today's title is full of these poems, and readers of all age will enjoy reading and looking at them. This is one of my favorite picture books. The story reminds me that even the simple act of planting flowers can make the world a better place. What Miss Rumphius does is to give everyone who sees her flowers a gift of beauty, and imagine what that does for them. Maybe it makes them happy and lifts them up. Maybe it reminds them that the world is a beautiful place. Maybe seeing the flowers allows them to move forward with hope in their hearts. When Alice was a small girl she used to talk to her grandfather about how, when she grew up, she would "go to faraway places," and when she grew old she would "live beside the sea." Alice's grandfather told her that in addition to these two things, there was a third thing that she must do, and that was to do something that would "make the world more beautiful." When Alice grew up to become Miss Rumphius she did indeed travel to far off lands, and she had all sorts of adventures. Then, when she began to get tired, she found a little house by the sea to live in. The question she now had was what she should do to make the world a more beautiful place. One day when she was out walking she found some beautiful lupines growing on a hillside. The lupines were the offspring of the flowers that she had planted in her own little garden the previous spring. Now Miss Rumphius knew what she would have to do. Back at home she sent away for bags and bags of lupine seeds and then she got to work sowing the seeds all over the countryside, making the hills and valleys around her home beautiful. This delightful story about dreams and the need to give something back to the world is both powerful and thought provoking. 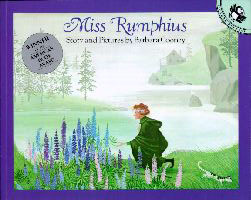 What the elderly Miss Rumphius does is not earth shaking, and yet it does make the world a more beautiful place, and her labours give lots of people great pleasure as they look at the fields of lupines that she sowed. The reader cannot help wondering what he or she can do to make the world a more beautiful place. Whatever one chooses to do, whether it is planting trees or joining a group to clean up the countryside, each effort to make the world more beautiful makes a difference. Books of Hope, 2017: Reviews of books that empower, uplift, and give the reader hope. 2016 was a very strange year. It was a year during which we were subjected to so much discord and anger in the media and in our communities, and so much bad news. The year left many people, including myself, feeling shaken and worried for the future. I was thinking about this a week or so ago and trying to figure out what I could do to make my world a little brighter and more hopeful. Naturally my thoughts turned to books. I have decided that I will review at least one book each week that offers up a message that is warming, thoughtful, and hopeful. I will choose books that remind us that the world is not always a terrible place. Perhaps the book will explore compassion. Perhaps it will tell the story of a person who has found a way to make the world a better place. Perhaps readers will see how differences can be overcome, and how bridges between conflicting groups can be built. Though all of the books I review were written for young readers, I want you to know that the Books of Hope that I am going to share with you during this year will suit readers of all ages. Adults can get a lot out of reading children's literature, so don't be afraid to read one of these titles for yourself. See what you discover and learn. You may be surprised! My hope is that these books will give you hope, and that that hope will help you to make our world a kinder, gentler, more compassionate place. Twenty years ago I got a chronic illness that changed my life. I had to adjust my expectations, learn to live within my limits, and most importantly learn to enjoy and love the new life that I had built for myself. It was not easy. At all. It still isn't. What I loved about today's picture book was the fact that it is about a character, Gary, who cannot do what his friends and relatives do, but he still manages to have a full life, one that offers him a unique perspective. In fact he is able to share what he learns with others, which is wonderful. Most of the time Gary is just like the other racing pigeons that he lives with. He eats what they eat, lives in a loft, and dreams of going on adventures. However, when the other pigeons leave in the travel basket to attend races, Gary stays home and works on his scrapbook. Gary cannot fly, and so he cannot join the other racing pigeons on race days. Instead, he lives vicariously through his friends, recording their race experiences in his scrapbook. One night Gary leans over from his perch so far that he loses his balance. Gary and his scrapbook fall into the travel basket, and the next day he, still in the basket, is taken far from home. When he arrives at his destination the basket is opened and the sky is “full of feathers and flapping wings.” The racing pigeons are off, but Gary, who cannot fly back home like the other pigeons, is stuck, lost in a city that he does not know at all. This wonderful picture book tells the story of a bird who cannot fly and who therefore cannot see the world. Except through the pages of his scrapbook. Then life presents Gary with a situation that could turn out to be a disaster and he has to figure out a solution. What is perhaps the best part of this delightful story is the way in which it ends. It turns out that Gary, the pigeon who cannot fly, has something to offer the pigeons who can fly. I know that children are the ones who are supposed to hope and wish for a snow day, but I have to confess that I hope and wish for them too. There is nothing like taking a day off work to play in the snow with dogs and family members; and to sit toasting toes in front of the fire afterwards. In today's poetry book we meet a little girl who desperately wants a snow day, and her reason for wanting such a day is even more important that having a day off from school. There is something wonderful about waking up in the early hours of the morning to discover that snow has fallen in the night. Everything is quiet, muffled by the snowfall, and there is a feeling of excitement that is intoxicating to the spirit. In today's picture book a little child ventures out into the night after the first snowfall and she has a magical adventure in the woods. Across the fields the companions go, along the railroad tracks, and into the woods, where animals watch their progress. The little girl’s ball of snow is quite big now and rolling it along is hard work. Then, there in the dark woods, the little girl sees a glowing gateway to somewhere else, and through it she goes rolling her ball of snow. In this wonderful book a simple nocturnal adventure unfolds to become something altogether bigger; something magical happens and we are transported to a wonderful place to celebrate the joy of a first snowfall.